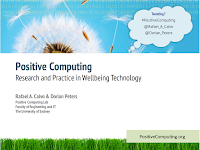 We're pleased to share some of the tools we've found useful to bridging wellbeing science and technology practice. From wellbeing determinant cards to worksheets on the spheres of autonomy, we make the tools we've used in workshops and practice available here. As requested, here are the slides from our course at CHI 2017. Every time we come across a technology intended to support wellbeing, we add it to the gallery. We haven't tried them all, but just browsing through the list helps demonstrate the real momentum behind the wellbeing technology movement. Please get in touch if you know of one we should add to the collection. These tools were created by Dorian Peters & Rafael Calvo and are free to use and share. Please refer to the Creative Commons license: Attribution-NonCommercial-ShareAlike. Share your feedback and let us know how you’ve used them!